March 2019: Research undertaken by Dr Ross Brown, Dr José Liñares-Zegarra and Professor John Wilson (all from the Centre for Responsible Banking and Finance) on the impact of Brexit on SMEs has been published in the journal Regional Studies. The article reports the first study of its kind examining the types of SMEs most affected by Brexit together with the nature of these likely effects. Larger, internationally-oriented and knowledge-based SMEs are particularly concerned, as are those located in key urban and peripheral geographic areas. The activities most affected are investment and exporting. Plans for future capital investment have been scaled down by around two-thirds of SMEs (62%) and plans to increase export sales are being scaled back by over three-quarters (77%). Worryingly, those most concerned – innovators and exporters – are the SMEs deemed most important for UK productivity growth. This important work has featured in UK Parliamentary debates in the House of Commons and the authors have given evidence to a select committee hearing in the House of Lords. This work has also received considerable attention in the international media outlets including the BBC, the Telegraph, The Conversation and Al Jazeera. The Scotsman included the news piece, Ross Brown and John OS Wilson: Small firms at Brexit's sharp end. See the press release: Over a million UK businesses see Brexit as a major obstacle to success. Download the article: The (potential) impact of Brexit on UK SMEs: regional evidence and public policy implications. January 2019: Centre for Responsible Banking and Finance's Professor John Wilson has been appointed Associate Editor for Journal of Financial Stability. The Journal provides a forum for theoretical and empirical issues in financial economics with a specific focus on financial stability, causes, management, resolution, and prevention of financial crises, including banking, securities market, payments and currency crises. November 2018: Dr Kais Bouslah, Dr José Liñares Zegarra, Professor Bert Scholtens (Centre for Responsible Banking and Finance) and Professor Bouchra M’Zali (Université du Québec à Montréal) have recently published a paper entitled "CEO risk-taking incentives and socially irresponsible activities" in the British Accounting Review. The paper has been awarded the FSI-PRI prize for the best academic article on responsible investing. The prize is awarded jointly by the Finance Sustainability Initiative (FSI) and the Quebec Members' Network of Principles for Responsible Investment (PRI). The paper examines the link between risk-taking incentives in CEO pay packages and socially irresponsible activities. The findings show a positive link, in particular during the period prior to the financial crisis 2007-2008. However, the increased scrutiny on compensation packages and the attention for reputational issues could have weakened this link. What might explain the link between pay packages and risk-taking prior to the crisis? It seems compensation contracts that encourage CEOs to undertake risky strategies put more emphasis on financial performance. The pursuit of short-term profits is not fully consistent with socially responsible behaviour. It is also possible that faced with financial pressures, CEOs underestimate the potential negative impacts of socially irresponsible behaviour. The findings of the paper have important policy implications as the design of executive compensation contracts can have profound implications for firm strategies, and overall societal welfare. While it is important for the board of directors to encourage CEOs to take risks and increase shareholder value, if such incentives lead to socially irresponsible behaviour, then this can have a long term impact on risk and profitability. Bouslah, K., Liñares-Zegarra, J., M'Zali, B., & Scholtens, B. (2018). CEO risk-taking incentives and socially irresponsible activities. British Accounting Review, 50(1), 76-92. October 2018: A group of University of St Andrews School of Management MSc Finance and Management masters students attended the 2018 Global Ethical Finance Conference in the RBS Conference Centre, Edinburgh, along with Programme Director Dr Xing (Jimmy) Chen of the Centre for Responsible Banking and Finance. Titled 'Regaining trust and demonstrating impact', the conference explored how trust in a sustainable economy can be revitalised, and how investors are confronting societal and economic challenges and feeding into the biggest sustainable finance shifts of our time. Other participants in the conference included representatives of banks, asset managers, faith-related investors, mission-driven endowments, charities and family offices. Dr Vania Stavrakeva, Professor Marios Panayidis and Dr David Marques-Ibanez will be presenting their research at the Centre for Responsible Banking and Finance (CRBF) in St Andrews in spring 2019. Dr Vania Stavrakeva, Assistant Professor of Economics at the London Business School, will deliver a research seminar on Wednesday 3 April 2019. Professor Marios Panayidis, Department of Accounting and Finance, University of Cyprus, will present a research seminar on Thursday 2 May 2019. Dr David Marques-Ibanez, Senior Economist at the Financial Research Division of the European Central Bank, will lead a research seminar on Wednesday 8 May 2019. Presentations will take place in the afternoon at the University of St Andrews School of Management and are organised jointly with the School's Financial Markets and Institutions research group. See our Events page for further details as they become available. September 2018: Dr Ross Brown, Dr José Manuel Liñares-Zegarra and Professor John Wilson from the Centre for Responsible Banking and Finance were commissioned by the ESRC-funded Enterprise Research Centre (ERC) to produce a State of the Art (SOTA) literature review on "Borrower Discouragement in SMEs". Each SOTA review provides a short (1200-1500 word) synthesis, summarising the main evidence points and knowledge gaps surrounding important topics affecting SME growth. The main goal of these mini literature reviews is to enable rapid dissemination within the policy community of complex topics such as "borrower discouragement". A recent ERC study by the authors suggests borrower discouragement affects nearly one in ten SMEs which equates to nearly half a million UK SMEs. The new review will help inform future policy making by organisations such as the Department for Business, Energy and Industrial Strategy and British Business Bank. The SOTA is now available here. September 2018: Professor John Wilson, Director of the Centre for Responsible Banking and Finance (CRBF), presented the results of his research on the credit union tax subsidy at a Building Societies Association Conference in London. The event was attended by prominent academics, industry practitioners and policymakers. Drawing on insights of empirical research (co-authored with Bob DeYoung, Kansas University; John Goddard, Aberystwyth University; and Donal McKillop, Queen's University of Belfast), John explained that the results of their research suggested that US credit unions use the proceeds of the federal income tax exemption to benefit depositor and borrowing members. However, a portion of the tax subsidy is diverted from members. These results provide valuable insights for policymakers involved in monitoring the allocation of the credit union tax subsidy. September 2018: Dr Anna L Sobiech from the Centre for Responsible Banking and Finance (CRBF) presented the results of her research on bank taxation at the International Workshop on Financial Systems Architecture and Stability (IWFSAS) in London. The IWFSAS provides a forum for academic researchers and policy makers to discuss issues related to the structure and design of financial systems and their impact on growth and financial stability. Anna's research (co-authored with Dimitris Chronopoulos and John Wilson, both also from the CRBF) examines whether bank taxes impact on the behaviour of corporate borrowers. Her study shows that corporate borrowers which are exposed to bank taxes via their lenders reduce investment activity and rely more on alternative sources of funding. Professors Michael Koetter and Niels Johannesen will be presenting their research at the Centre for Responsible Banking and Finance (CRBF) in St Andrews. Michael Koetter, Professor and Head of the Department of Financial Markets at the Halle Institute for Economic Research (IWH), will deliver a research seminar on Monday 24 September 2018. Niels Johannesen, Professor at the Department of Economics of the University of Copenhagen, will lead a research seminar on Wednesday 28 November 2018. 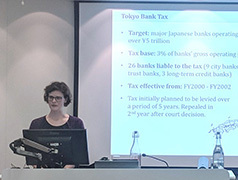 July/August 2018: During her one-month research visit to Japan hosted by Hirofumi Uchida (Kobe University), Anna Lucia Sobiech from the Centre for Responsible Banking & Finance (CRBF) was invited to present the results of her research on the taxation of Japanese banks at the MEW Research Seminar held at Kobe University. This seminar series has a 20-year long tradition and attracts prominent academics from the Kansai area. 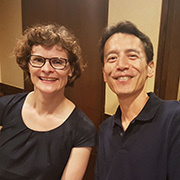 Anna Sobiech also presented her research to scholars at the Research Institute of Economy, Trade and Industry and at Hitotsubashi University in Tokyo. Her research on the Tokyo bank tax (co-authored with Sanjay Banerji, Dimitris Chronopoulos and John Wilson) provides important insights for Japanese policy makers and banking scholars. Results suggest that Japanese banks are highly sensitive to taxes. An increase in tax costs affects banks' effort to monitor borrowers and leads to an overall reduction in financial intermediation activity. June 2018: Professor John Wilson, Director of the Centre for Responsible Banking and Finance (CRBF), presented the results of his research on bank taxation at a European Commission – MoFIR Workshop in Ancona, Italy. The event was attended by prominent academics, industry practitioners and policymakers. Drawing on insights of empirical research (co-authored with Anna Sobiech, Dimitris Chronopoulos and Sanjay Banerji, all also at the CRBF), John explained that the results of their research suggested that taxes specifically targeted at the banking industry impacted on the availability and cost of credit to borrowers, as well as interest paid to depositors. These results provide valuable insights for policymakers involved in the design of bank regulation and supervision following the global financial crisis. May 2018: Dr Ross Brown from the Centre for Responsible Banking & Finance (CRBF) was invited to write a debate article for The Herald to comment on the topical issue of bank branch closures. The number of bank branches is now a third of what they stood at 30 years ago. Commenting on his recent research on the geographical variations in credit access in UK SMEs, the article examines the potential impact of further bank branch closures. Evidence suggests that when a bank branch disappears lending can fall by as much a 63% in the affected postcode location. His work strongly suggests SMEs incur "liability of distance" effects and the more distant a small firm is from a bank branch the more likely they are to encounter credit constraints — and this disproportionately impacts innovative firms. Read the article at Bank branch closures hit SMEs the hardest. May 2018: Researchers from the Centre for Responsible Banking and Finance have undertaken a study on borrower discouragement in SMEs. The team was led by Dr Ross Brown, with co-authors Dr Jose Liñares-Zegarra and Professor John Wilson. Their report has just been published. Commissioned by the ESRC-funded Enterprise Research Centre, the work examines the nature and dynamics of firms who do not apply for bank finance for fear of rejection – so-called discouraged borrowers. The study found that levels of discouragement vary across the population of SMEs and that growth-oriented SMEs are substantially more likely to be discouraged than typical SMEs. The report aims to inform the future interventions of bodies such as the British Business Bank. Download a copy: An empirical examination of discouraged borrowers in the UK (pdf). 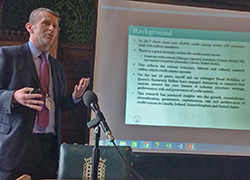 May 2018: Professor John Wilson, Director of the Centre for Responsible Banking and Finance, presented on the impact of his credit union research at the House of Commons. This was part of the Academy of Social Sciences Making the Case for Social Sciences Campaign and focused on Accounting and Finance. The event was attended by prominent public figures including Elizabeth Truss, Chief Secretary to the Treasury. Drawing on insights of empirical research (co-authored with Donal McKillop, Queen's University of Belfast) spanning almost 20 years, John explained that their research has featured prominently in outlets beyond academe via reports produced by: devolved governments (in Scotland, Northern Ireland); accounting (Institute of Chartered Accountants, Scotland) and trade association bodies (US Filene Institute); and US Congressional Hearings as well as invited talks at the US Federal Deposit Insurance Corporation in Washington and at Westminster Briefing Events in London (amongst others). The most direct and significant impact of the research was evidenced via his and McKillop's appointment, membership and participation in the Irish Government Credit Union Commission and its subsequent recommendations, which in turn have influenced primary legislation and subsequent widespread structural change in the credit union industry. Dr Ross Brown from the Centre for Responsible Banking & Finance (CRBF) has been awarded a research grant from the British Academy/Leverhulme Trust Research Grants Scheme. The research commences in June 2018 and will undertake a "Longitudinal Examination of Equity Crowdfunding in the UK". This will be the first research to systematically track start-ups funded using this emerging form of alternative finance and will measure how this finance benefits these innovative ventures. Dr Brown is a leading authority on the topic of SME finance in the UK and has published extensively on the topic of equity crowdfunding including a recent research paper in the International Small Business Journal titled Working the Crowd: Improvisational Entrepreneurship and Equity Crowdfunding in Nascent Entrepreneurial Ventures. April 2018: Professor John Wilson, Director of the Centre for Responsible Banking and Finance, presented evidence at EU Internal Markets Committee at the House of Lords. This was part of an evidence session investigating the impact of Brexit on UK Small and Medium Enterprises (SMEs). Using insights of ongoing empirical research (co-authored with Ross Brown and José Liñares-Zegarra), John explained that the vote to leave the EU in 2016 has added to the multitude of challenges facing SMEs and led to increased uncertainty regarding future trading conditions. The extent to which SMEs are impacted by Brexit will depend not only on the final terms of any resultant deal between the UK government and the EU, but also in terms of the size, age, business orientation (such as internationalisation, growth intentions, innovativeness) industry and geographic location. He explained that SMEs that perceive Brexit as a significant business obstacle are less likely to: seek external finance; increase capital investment; generate product and process innovations and pursue growth ambitions. And if this comes to fruition this is likely to have a detrimental impact on the future growth, innovation and prosperity of SMEs and the wider UK economy. Employee owned firms are often labelled "responsible enterprises" on account of their inclusive workplace practices and strong commitment to job security. March 2018: Dr Ross Brown from the Centre for Responsible Banking & Finance (CRBF), an expert on small business finance, has just had a report published by the Organisation for Economic Cooperation & Development (OECD). The report was commissioned jointly by the OECD with the European Commission to investigate the effectiveness of financial lending instruments for small and medium-sized enterprise (SMEs). These are funding mechanisms for SMEs (e.g. credit guarantees, public sector venture capital and soft loans) designed to alleviate imperfections within small business financial markets. These instruments are playing a growing role within economic development and regional policy across advanced economies. The European Commission intends that the research will help inform future EU cohesion policy. A copy of the report can be downloaded from the OECD: When to use financial instruments. January 2018: Professor John Wilson, Dr José Liñares Zegarra and Dr Ross Brown from the Centre for Responsible Banking and Finance have launched a study examining the impact of Brexit on UK Small and Medium-Sized Enterprises (SMEs). The first study of its kind, the research draws on UK's Longitudinal Small Business Survey which covers 10,000 UK SMEs. The study examines the types of SMEs most likely to have the strongest reservations regarding Brexit as well as the potential (self-reported) outcomes for these firms. The paper suggests that Brexit is having a material and potentially damaging effect on UK SMEs and those with the greatest concerns are larger, innovative and export-oriented SMEs. Typically, these are considered to be the firms who make the strongest contribution to productivity and economic growth. The likely impact of Brexit-related uncertainty could result in reduced levels of capital expenditure, reduced access to external finance and weaker growth expectations. The work has featured strongly within the media, including the BBC: SMEs may be worst affected by Brexit, research suggests. See Universirty of St Andrews news: The Impact of Brexit on UK Small and Medium-Sized Enterprises. The findings are available online in CRBF working paper: What happens if the rules change? Brexit, uncertainty and UK Small and Medium-Sized Enterprises. On the 12th and 13th December 2017, the Centre for Responsible Banking and Finance convened the 2nd Contemporary Issues in Banking Conference at the University of St Andrews School of Management. The inaugural conference was in 2015, and was so well received that it has been instituted as a bi-annual event. The authors and discussants of the papers presented at the conference gathered from leading universities and policy institutions around the globe, including the European Central Bank, the Federal Reserve Bank of New York and The Board of Governors of the Federal Reserve System. The presentations covered a wide range of banking topics of interest to academics, policymakers and practitioners alike. "The size and growth of microfinance institutions"
December 2017: New research by John Wilson (from the CRBF), with José Liñares-Zegarra (Essex Business School and CRBF) published in the British Accounting Review examines the relationship between size and growth for a worldwide sample of microfinance institutions with different ownership forms and commercial orientation for 120 countries over the period 2000-2014. The authors find little evidence that size confers growth advantages to microfinance institutions. However, they do find some evidence that growth rates for credit unions and microfinance institutions with a not-for-profit commercial orientation present negative growth persistence. The variability of growth rates differs across the size distribution of microfinance institutions, and this result is consistent across commercial orientation and ownership form. Other factors found to affect the growth of microfinance institutions include age (new microfinance institutions grow faster than young and mature counterparts), levels of bad debt, efficiency and regulation. "Non-interest income and bank lending"
November 2017: New research by Pejman Abedifar from the CRBF, with Amine Tarazi and Philip Molyneux, published in the Journal of Banking & Finance, examines the influence of non-interest activities on bank lending in terms of loan quality and interest spread. The authors also explore the possible existence of profit complementarities between non-interest activities and lending. They study 6,921 US commercial banks between 2007:Q3 and 2016:Q3 and find that non-interest activities have no adverse influence on bank credit risk. The study shows that banks with assets between $100 million and $1 billion that have a greater share of fiduciary income have lower credit risk. They also have lower interest rates on loans secured by real estate, and higher franchise values, particularly post-crisis. Moreover, banks in the aforementioned size range benefit from synergies in joint production of non-interest income and lending, whereas other banks, in particular smaller banks (below $100 million in assets) suffer from diseconomies of joint production. Larger banks exhibit cross-subsidisation between several non-interest activities and lending business. "Heterogeneous market structure and systemic risk: Evidence from dual banking systems"
November 2017: New research by Pejman Abedifar from the CRBF, with Paolo Giudici and Shatha Qamhieh Hashem, published in the Journal of Financial Stability, investigates how banking system stability is affected when we combine Islamic and conventional finance under the same roof. The authors compare systemic resilience of three types of banks in six GCC member countries with dual banking systems: fully-fledged Islamic banks (IB), purely conventional banks (CB) and conventional banks with Islamic windows (CBw). They employ market-based systemic risk measures such as MES, SRISK and CoVaR to identify which sector is more vulnerable to a systemic event. They also compute weighted average GES to determine which sector is most synchronised with the market. Moreover, they use graphical network models to determine the most interconnected banking sector that can more easily spread a systemic shock to the whole system. Using a sample of observations on 79 publicly traded banks operating over the 2005–2014 period, they find that CBw is the least resilient sector to a systemic event, it has the highest synchronicity with the market, and it is the most interconnected banking sector during crisis times. Future Issues in unsecured in consumer debt (by José Liñares-Zegarra and John Wilson). 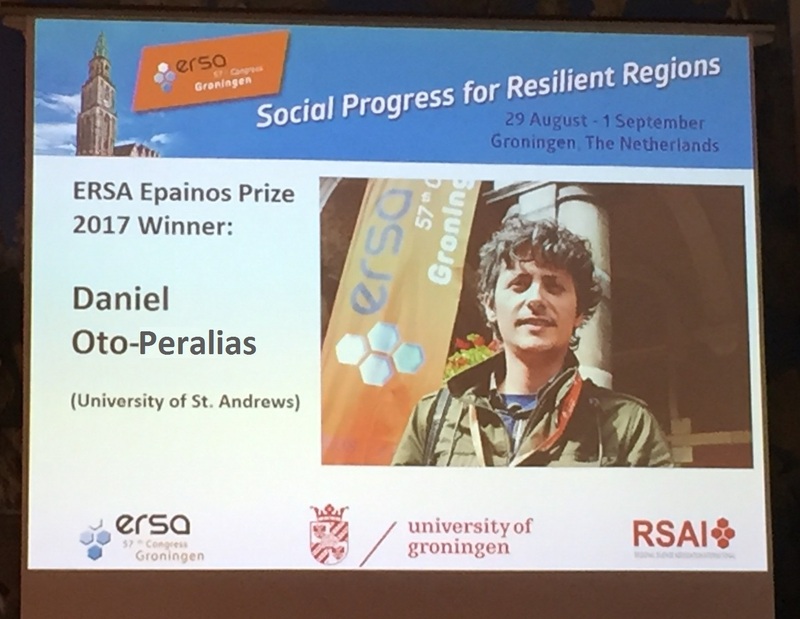 Dr Daniel Oto-Peralías from the CRBF has been awarded the Epainos prize for the best paper presented by a young researcher at the 57th European Regional Science Association Congress in Groningen (Netherlands). According to the organisers, "his paper with the title 'Medieval Frontier Origins of a Country's Economic Geography: The Case of Spain' provides enlightening insights into settlement patterns and spatial discontinuity. Its outcomes are of significant relevance for the field of regional science." In June 2017, Dr Louis Nguyen from the CRBF presented his paper "Regulatory Spillovers on Mortgage Market: The Role of Local Competition" to the Research School of Finance, Actuarial & Statistics, Australian National University (ANU), as an invited speaker in their seminar series. The paper is co-authored with Dr Linh Nguyen, also from the CRBF, and Mr Ivan Lim from the University of Leeds. The paper studies the inadvertent effects of a governance reform on the local mortgage markets and housing outcomes. a new set of quantitative problems with solutions and revised questions for discussion at the end of each chapter. supervision of systemically important banks. June 2017: Multidisciplinary journal Health Services and Outcomes Research Methodology publish research by Dr Manouchehr Tavakoli from the Centre for Responsible Banking & Finance (CRBF). In work done with an international team, he asks whether Scottish hospitals improved their productivity and efficiency over time in an environment where they were required to improve their services. By using regression, the authors find a definite and statistically significant trend of improvement, which could encourage hospital management that they have been doing more with less — news that could be particularly relevant in times of more austerity in government spending but without a decrease in demand. In May 2017, Dr Linh Nguyen and Dr Louis Nguyen from the CRBF presented their paper "Regulatory Spillovers on Mortgage Market: The Role of Local Competition" at the Adam Smith Business School, University of Glasgow as invited seminar speakers in their Ward Accounting Seminar Series. The paper is also co-authored with Mr Ivan Lim from the University of Leeds. The paper studies the inadvertent effects of a governance reform on the local mortgage markets and housing outcomes. Researchers from the Centre for Responsible Banking & Finance (CRBF) were invited to provide thought papers for a prestigious conference organised by the Financial Conduct Authority (FCA) in April 2017. The FCA commissioned the papers from CRBF members and other leading experts for their Future Horizons conference which was designed to examine future hypothetical financial and societal landscapes to draw out the implications, future risks and opportunities for society, financial services and regulation. CRBF members produced conference papers on diverse topics, including the future of SME finance, future issues in bank taxation and unsecured debt. The papers will directly inform financial regulation in the UK. See the Future Horizons, April 2017, papers [pdf]. February 2017: Dr Ross Brown from the CRBF has had a paper published in the journal Entrepreneurship and Regional Development exploring myths embedded in entrepreneurship policy. Ever since the economist David Birch provocatively asked the question "who creates jobs?" in the 1970s the topic of rapid firm growth has captivated the entrepreneurship and small business community. Birch's pioneering work found that small rapidly growing firms – so-called "gazelles" – were in fact the primary source of new net job creation within the US economy. However, research by Dr Brown has discovered that policy makers have certain misconceptions about the nature of these firms. These "myths" are at odds with empirical evidence and are crucially important as they continue to shape and misinform public policy. See a summary of the paper posted as a guest blog for the Centre for Entrepreneurs. See the Forbes coverage, The 7 Myths Of High Growth Firms, which calls the research "a wakeup call for governments to consider whether their interventions are as effective as they could be." February 2017: Historical frontiers can shape the economic geography of countries by generating persistent patterns of inequality and underdevelopment. These are the conclusions from research by Daniel Oto-Peralías and Diego Romero-Ávila from the CRBF published in the Journal of the European Economic Association. They study the effect of a medieval frontier that existed in southern Spain between Castile and the Emirate of Granada. Their analysis shows that the insecurity created by the frontier led to the concentration of power in the hands of the military elite, generating a pattern of inequality that has persisted until the second half of the 20th century. In turn, it is shown that the territory exposed to frontier insecurity is relatively poorer today. December 2016: New research by Pejman Abedifar from the CRBF, with Amine Tarazi and Iftekhar Hasan, published in the Journal of Economic Behavior & Organization, highlights the importance of Islamic banking in financial deepening and economic development of Muslim countries. The study shows a positive relationship between the market share of Islamic banks and the development of financial intermediation and economic welfare in countries where Islamic and conventional banks operate alongside each other. They find that the relationship is stronger in low income or predominantly Muslim countries. The authors also explore the possible implications for conventional banks operating in a dual-banking system. The analysis reveals that a greater market share of Islamic banks is associated with higher efficiency of conventional banks. December 2016: New research on the determinants of social capital by Daniel Oto-Peralías and Diego Romero-Ávila from the CRBF has been published in Economics Letters. The article establishes and tests the hypothesis that persistent inequality undermines social capital. By using blood donation data to measure social capital and land inequality as a proxy for persistent inequality, the authors find a robust negative effect of inequality on blood donation in a municipal-level analysis. Therefore, a society suffering severe inequality may develop social and political apathy. If the situation persists for a long time, this apathy becomes a cultural trait hindering the creation of social capital. Given the importance of social capital in the economy, this has clear implications for economic well-being in the medium and long run. Banking: A Very Short Introduction, written by Professor John Wilson of the CRBF (with John Goddard, Bangor University) was published in December 2016 by Oxford University Press. As part of the bestselling Very Short Introductions series, which has sold over seven million copies sold worldwide, this book provides a comprehensive introduction to banking. The authors explore issues of supervision and regulation of the banking industry in light of the recent global financial crisis and subsequent sovereign debt crises as well as providing a thoughtful consideration of the future of the banking industry. 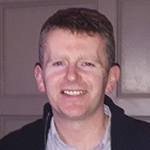 December 2016: Dr Ross Brown from the CRBF has recently started a project on entrepreneurship with the government in Northern Ireland. This work is to examine the role of high growth entrepreneurship and is designed to help inform their new economic strategy. Dr Brown has also been commissioned to do research on entrepreneurship and employment creation in middle income economies for a think tank in South Africa. December 2016: New research examining the impact of regulatory reform, starting from the inception of the Single Market in 1992, on bank productivity was published in the European Journal of Operational Research. Findings produced from a large scale econometric investigation of Eurozone banking industries by Professor John Wilson from the CRBF (with Barbara Casu, Cass Business School, Claudia Girardone, Essex Business School and Alessandra Ferrari, Reading University) suggest that productivity growth driven by technological progress has occurred in Eurozone banking industries. While technological spillovers across countries have led to a progression toward the best technology, significant long run differences persist. In November 2016, Dr Louis Nguyen from the CRBF presents his paper "Does CEO cultural heritage affect performance under competitive pressure?" to the School of Economics, Finance and Management, University of Bristol, as an invited speaker in their accounting and finance seminar series. Also in November, Professor Bert Scholtens presents a research paper on the financial impact of divestment from fossil fuels at the Bank of England/CEP workshop, "Central Banking, Climate Change and Environmental Sustainability" in London. In December 2016, Mrs Anna Lucia Sobiech presents a research paper on the effects of taxation on bank margins at the Conference on Money, Banking and Finance in Rome. November 2016: New research examining the determinants of saving for old age around the world by Professor Georgios Panos from the CRBF (with Asli Demirgüç-Kunt and Leora Klapper, World Bank) was published in Retirement System Risk Management: Implications of the New Regulatory Order (Oxford University Press), a book edited by Olivia Mitchell, Raimond Maurer and Michael Orszag. The research finds that about 25 percent of adults worldwide save for old age, with rates exceeding 35 percent in high-income Organisation for Economic Co-operation and Development economies and the East Asia and Pacific region. On average, men are slightly more likely than women to save for this purpose, but the gender gap is deeper in developing countries. Worldwide, saving for old age is more common among older adults, more educated adults, and adults who own accounts. Adults in countries with English legal origin, and with high savings rates, are also more likely to save for old age. Contemporary Issues in Financial Institutions and Markets, edited by Professor John Wilson of the CRBF (with Barbara Casu and Daniella Fabbri, Cass Business School), was published in November 2016 by Routledge. The volume brings together original research by outstanding young academics in the area of banking and finance, and covers a broad range of topics including: bank business models, bank competition and stability, credit card pricing and risk; bank supervision; and international investments. October 2016: New research examining the effects of earnout (contingent payment) contracts used in US financial services mergers and acquisitions was published in the International Review of Financial Analysis. Findings produced from an extensive analysis of merger deals by Professor John Wilson and Dr Leonidas Barbopoulos from the CRBF (and Phil Molyneux from Bangor University) suggest that the use of earnout contracts leads to significantly higher acquirer returns. Acquirer returns are enhanced further when the management team of the target institution is retained in the post-acquisition period. August 2016: New research examining the effects of Prompt Corrective Action on the behaviour of cooperative financial institutions was published in the Journal of Financial Services Research. Professor John Wilson from the CRBF (with John Goddard, Bangor University and Donal McKillop, Queen's University Belfast) assesses the determinants of US credit union capital ratios, before and after the implementation of a prompt corrective action capital adequacy regulatory framework in 2000. The findings produced by the authors suggest that capitalisation varies pro-cyclically, and until the financial crisis credit unions classified as adequately capitalised or below followed a faster adjustment path than well capitalised credit unions. This pattern was reversed in the aftermath of the crisis. June 2016: Dr Ross Brown of the Centre for Responsible Banking and Finance has won research funding from the Department for the Economy in Northern Ireland. The project is being done with colleagues from London School of Economics and the University of Stirling. It will explore growth-oriented SMEs in Northern Ireland’s entrepreneurial ecosystem and will inform the new Economic Strategy being developed by Northern Ireland's Executive. This work extends Dr Brown’s international reputation as a leading authority in funding and high growth entrepreneurship. He has completed research in these areas for the Scottish Government, the UK’s Department for Business, Innovation and Skills and the OECD. February 2016: Centre for Responsible Banking and Finance's Dr Georgios Panos and his team have won a €1.6m interdisciplinary collaborative grant from the European Commission (Horizon 2020). Work is now beginning on the new research project led by a 6-party EU consortium. The project, which will run until 2019, aims to deliver a user-interactive online platform for the enhancement of financial capability. Development of the PROFIT platform (Promoting Financial Awareness and Stability) brings together researchers and professionals with expertise across accounting and finance, economics, information technology, computer/software engineering and education, along with a range of private, third-sector and institutional partners. Dr Panos said: "By the end of the project the team will have generated a unique financial awareness and education toolkit, suitable for open-democracy purposes within the EU and conducive to a number of desirable outcomes, including impact cases and MOOCs." See the PROFIT press release [pdf]. The Handbook of Post Crisis Financial Modelling, edited by Professors John Wilson and Phil Molyneux of the CRBF (with Emmanuel Haven, Sergei Fedotov and Meryem Duygun), was published in December 2015 by Palgrave Macmillan. The volume explores how financial modelling may be re-interpreted in light of the 2008 crisis. It brings together original research by leading practitioners and academics in the areas of banking, mathematics and law. An excellent keynote speech entitled 'When do laws and institutions affect recovery rates on collateral?' was delivered by Professor Hans Degryse (KU Leuven). Selected papers from the conference will appear in a special issue of the British Accounting Review that will be published in late 2016. November 2015: Centre for Responsible Banking and Finance's Dr Daniel Oto-Peralias was invited by the World Bank to speak during "Law, Justice, and Development Week 2015" at their headquarters in Washington DC. This annual event brings together scholars, practitioners, officials from international institutions and representatives from civil society around the issues of law and development. The focus this year was "Governance and the Law in the social and economic advancement of nations". Daniel's contribution to the conference was a discussion about the influence and current validity of the legal origins theory. Dr Louis Nguyen of the Centre for Responcible Banking and Finance spoke at "Economics of Culture – Balancing Norms Against Rules", a conference organised by the Federal Reserve Bank of New York in November 2015. The aim of the conference was to promote a better understanding of how culture affects the structure and conduct of firms, in particular financial firms. The invitational event featured eight papers focusing on different aspects of corporate culture and ethical conduct in the banking sector. Louis presented the paper "Does CEO's cultural heritage affect performance under competitive pressure?" jointly with co-authors Jens Hagendorff and Arman Eshraghi. The paper explores how a CEO's cultural heritage, traced back over generations, may affect a firm's investment policies and profitability today. September 2015: Dr Ross Brown from the Centre for Responsible Banking & Finance launched the findings from the first major investigation of equity crowdfunding in the UK. Harnessing the Crowd: The Demand-Side Dynamics of Equity Crowdfunding in Nascent Entrepreneurial Ventures was published by the RBF in our Working Paper Series. The findings have been widely publicised across the print media and on BBC Radio Scotland. Hear the "Good Morning Scotland" interview (at 1hr 43 mins) until 21 October 2015. See cityam.com: "Crowdfunding: Enter the disruptive finance revolution". See in The Scotsman: "Call for Scots companies to boost crowdfunding". See University of St Andrews Press Release: "British start-ups embrace the £146m crowdcube economy". Short, medium and long term aggregate household debt can affect population health in different ways. That is one of the key findings of research by members of RBF (Maya Clayton, José Liñares-Zegarra and John Wilson), which was published in April 2015 in Social Science and Medicine (DOI: 10.1016/j.socscimed.2015.02.002). The research examines aggregate debt and health data across 17 European countries over the period 1995 to 2012. The results suggest that both short and medium-term debt has a positive effect on health outcomes. However, long-term unsecured aggregate household debt and mortgage debt are associated with poorer health outcomes. Overall, the results suggest that aggregate household debt is an important determinant of population health across countries. The authors conclude that: "Household debt is a corner-stone of modern market economies, and many policy choices either encourage or inhibit individuals from taking on that debt. Given the potentially important health consequences of debt (for individuals and in aggregate), and given the complex implications of debts of different types and maturities, greater research-based understanding and greater policy consideration are warranted." New research examining the controversial Scottish Government funded innovation initiative, the Intermediate Technology Institutes (ITIs), was published in January 2015. Dr Ross Brown from the Centre for Responsible Banking and Finance led the team of entrepreneurship researchers from the Universities of St Andrews, Glasgow and Edinburgh whose work examines the spectacular failure of the ITIs programme. The findings, published in the journal Regional Studies, have strong implications for the design of future innovation policy. See University of St Andrews Press Release: "Academics warn policy-makers must learn from their mistakes". See The Scotsman: "Academics say lessons must be learned from ITIs failure". See BBC News: "Warning to learn from failed scheme to aid technology businesses". January 2015: Centre for Responsible Banking and Finance's Professor John Wilson has been appointed Associate Editor for Finance Research Letters. He will be responsible for papers covering banks and other depository institutions. Contemporary Issues in Financial Institutions and Markets, Volume 2, edited by RBF Director Professor John Wilson, with Claudia Girardone and Philip Hamill, was published in December 2014. The volume covers a broad range of topics including: stock returns, capital structure arbitrage, credit rating agencies, credit default swaps, and bank market power. The Oxford Handbook of Banking, Second Edition (Oxford Handbooks in Finance), edited by RBF Director Professor John Wilson, with Allen N. Berger and Philip Molyneux, has been published (2015). The volume provides an overview and analysis of developments and research in banking. This edition includes new chapters on: banking in Africa, competition in banking, complexity and systemic risk, corporate governance in banking, liquidity creation, market discipline in financial markets, securitization, shadow banking, sovereign debt crises, and supervision of systemically important banks. Centre for Responsible Banking and Finance's Dr Dimitris Chronopoulos together with Dr George Dotsis and Professor Nikolaos Milonas from the University of Athens, Greece have been awarded a grant from the British Academy in partnership with the Society for the Advancement of Management Studies (BA-SAMS Small Research Grant) for a duration of 19 months. Their investigation will focus on the impact of institutional and firm-level corporate governance factors on banks' holdings of home sovereign debt. Such debt could induce negative feedback loops between banks and the state and compromise banks' ability to efficiently allocate funds to worthwhile projects during sovereign debt crises. This study aims to advance our understanding on the determinants of banks' sovereign debt portfolio holdings, contribute to the ongoing debate on bank regulation and financial stability, and offer policy implications to regulatory bodies. Centre for Responsible Banking & Finance's Dr Ross Brown, together with Dr Neil Lee from London School of Economics, has authored a report examining the funding issues facing high growth SMEs. The work, Funding issues confronting high growth SMEs in the UK, was undertaken for the Institute of Chartered Accountants Scotland (ICAS) and found many high growth SMEs were reluctant to give up equity or borrow in case this diminishes their autonomy. It contains important policy implications for both the supply and, the often neglected, demand-side of SME funding. News of the work, which was published in June 2014, has been widely disseminated in media including The Herald and the Financial Times. See University of St Andrews Press Release: "Debt-averse businesses are holding back economic recovery". May 2014: Dr Ross Brown, University of St Andrews School of Management, has been awarded a research contract with colleagues from the University of Stirling to investigate funding issues within employee-owned businesses. The research is funded by Cooperative Development Scotland and will involve a major programme of interviews with current and potential employee owned firms, banks and intermediaries. Honours student Ludovine A Tarsia presented her research at a University-wide poster presentation event for the Undergraduate Research Internship Programme (URIP). Under the URIP scheme, the University of St Andrews funds 20 undergraduates to carry out research over ten weeks during the summer vacation. Supervised by RBF's Dr Kais Bouslah and Dr José Liñares-Zegarra, Ludovine's research, titled "Redefining Economic Development: The Role of Noneconomic Factors", was completed in summer 2013. At the event showcasing undergraduate research excellence, Ludovine's presentation was skillful and engaging. Our photo right shows Ludovine with her poster. The abstract of the research is below. 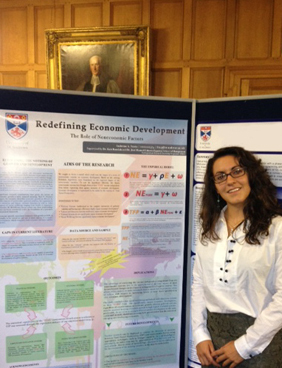 The poster can be viewed at URIP Poster - Redefining Economic Development (PDF, 1,204 KB). The concept of economic development is used in the literature interchangeably with that of economic growth. In this research, we first introduce a clear-cut distinction between economic growth and economic development. We then construct a model in order to test the impact of noneconomic factors on economic development, as measured by Total Factor Productivity (TFP). The model is tested using data on economic and noneconomic drivers of growth across 104 countries covering the period 1990-2012. The noneconomic factors are categorised into four "systems", based on different aspects of socio-institutional order: "political systems", "labour and education systems", "cultural systems" and "social wellbeing systems”". Our results suggest that the "pure" –i.e. income-independent—components of "social wellbeing" and "labour and education" systems have a statistically significant impact on TFP. However, the "pure" components of "political" and "cultural" systems seem to have a limited impact on TFP. Overall, the results could help policy makers to make informed decision about how to prioritise areas of reform with respect to augmenting levels of economic development. The University of St Andrews is a charity registered in Scotland : No SC013532.